In March 2014, WHO’s Global Outbreak Alert and Response Network (GOARN) asked for assistance from the European Mobile Laboratory (EMLab) Project. The Project shipped one of its laboratories – packed in 10–15 boxes that weigh 30 kg each and can be transported by commercial airplane or two trucks – to Guéckédou, Guinea. The laboratory contains equipment to test samples of human blood and diagnose cases of Ebola virus disease in a safe environment, using class-three biosafety cabinets, for maximum protection from the virus. Since the laboratory was established, the Ministry of Health of Guinea, WHO and a laboratory team from Médecins sans Frontières, have been investigating the outbreak, collecting and analysing blood samples to learn more about the virus and its source. The partners have also sent samples to laboratories in Europe for further analysis. “The inside of the laboratory tent can reach temperatures of 40 oC, so working in a protected environment – in gloves, a medical gown and sometimes a protective mask covering your head – can be uncomfortable. But the work is extremely rewarding, particularly as we are helping to improve capacity among local lab staff,” said Dr Kilian Stoecker, of Germany. Since the beginning of the outbreak, over 25 scientists and technicians have been deployed in 6 teams for an average of 4 weeks each, and more teams will be deployed as needed. Over 600 samples (of blood, swabs and urine) have been tested so far, over 200 of which tested positive for the Ebola virus. 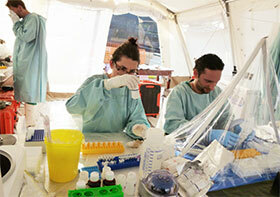 Almost all the European biosafety-level-four (BSL4) laboratories and other institutes specialized in the diagnosis of haemorrhagic fever diseases have provided the EMLab consortium with skilled scientists and technicians to staff the mobile laboratory in Guinea. Confirming cases of Ebola virus disease through laboratory testing and analysing the virus are essential to track where the virus is being transmitted and to take steps to contain the outbreak, as well as understand its genetic make-up and build local capacity to address possible future outbreaks. The Bundeswehr Institute of Microbiology in Munich, Germany developed the mobile laboratory, which was provided as part of the EMLab Project to improve capacity to respond to serious outbreaks of infectious disease in Europe and Africa. The Project aims to strengthen scientific cooperation between Europe and Africa, to help African public health and research institutions manage outbreaks and conduct research, and to enhance scientific knowledge about agents that cause serious disease: bacteria, viruses, fungi and parasites. Funded by the Cooperation Office of the European Commission’s Directorate-General for Development and Cooperation (EuropeAid), and coordinated by the Bernhard Nocht Institute for Tropical Medicine in Hamburg, Germany, the Project brings together many partners from the United Kingdom (Public Health England, Porton Down), Germany (the Bundeswehr Institute of Microbiology, Munich; the University of Marburg; and the Robert Koch Institute, Berlin), Italy (Lazzaro Spallanzani National Institute for Infectious Diseases, Rome), France (Laboratoire P4 de l’Institut national de la santé et de la recherche médicale (INSERM-P4), Institut Pasteur, Lyons), Switzerland (Spiez Laboratory), Slovenia (University of Ljubljana) and Hungary (National Centre for Epidemiology, Budapest). Ebola virus disease (formerly known as Ebola haemorrhagic fever) is a severe, often fatal illness, with a case fatality rate of up to 90%. It is one of the world’s most virulent diseases. It can be controlled, however, through the use of recommended protective measures in clinics and hospitals, at community gatherings and at home. The current Ebola outbreak in Guinea, Sierra Leone and Liberia has killed more than 450 people since March 2014. WHO is supporting the national authorities in their responses.